Welcome to KanchanGauri Women's Co-operative Credit Society Ltd. Dombivili. We are a co-operative credit society completely run by women working towards financial empowerment and stability of the society. We are successful pioneers in the field with numerous awards and recognitions to our credit. Our commitment, honesty and operational excellence have seen us rise in strength to four branch offices. Our area of operations has now been extended from Dombivili up to Thane, a mark of trust and respect by the authorities. Our constant increase in deposits and investments, is a proof of our increasing customers and their trust. Our permissible business horizon is entire Maharashtra now. Women's empowerment was essential to the progress and upliftment of our society. There was a need to make women financially independent and stable for equality and betterment of family life. To help women save, habituate them to banking and to make them independent with easily available loans was the motive behind setting up Kanchangauri. Inspired by our promoter Mrs. Indutai Bapat, we commenced operations on 2 May, 1982 led by our founding president Mrs. Meeratai Bhagwat. Our consulting advisor Mr. Madhukarrao Bhagwat graciously lent us his home as our office premises. Under his and Mr. Anantrao Kulkarni's able guidance, our credit society got off to a good start. From then to now, we have crossed numerous milestones to become one of the most trusted and fast-growing credit societies. Our purpose is to provide financial services to the women, the underprivileged, the tribal peoples and to all those who need them the most, reaching every class of society. Giving the humble half of our world access to organised banking, we are dedicated to the upliftment of masses through fair practices and easy banking. Today, to enable our services to make a difference to a larger part of the society, we are not limited only to women customers. Anyone can be our member and enjoy the advantages of our credit society. Has successfully carried out her responsibilities as Joint Secretary & Vice-Chairperson. Mrs. Deepali Godbole Director Director from 1982 to 86 and since 2000. Has also successfully carried out her responsibilities as Chair person Vice-Chairperson, Joint Secretary etc. Has successfully led our operations in various capacities like Chair person Vice-Chairperson, Joint Secretary etc. 7th March '82: Registered on the auspicious occasion of Ramnavmi under registration number TNAKYNRSR206. 2nd May '82: Began operations from the residence of Mr and Mrs. Bhagwat. 6th August '83: First branch office called Vardayili set-up. 20th Dec '92: Second branch office called Vaibhavgauri commenced operations. 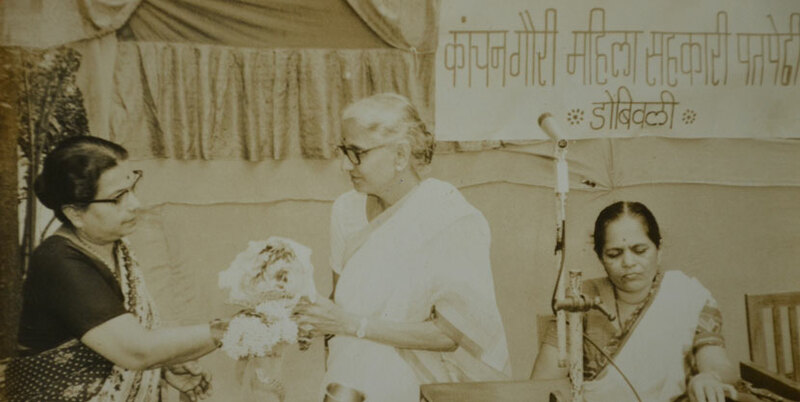 1994 - 95: Awarded as The best credit society for women' by Vivek Vyas Peeth. 3rd May '95: Third branch office called Varadlakshmi commenced operations. 1st April '95: Two work shifts were started for the convenience of customers. 7th August: Fourth branch office called Umeshnagar commenced operations. 2003-04: Jyotirbhaskar Jayant Salgaonkar paid us a visit and expressed his happiness about the way we worked. 25th Feb '05: The main branch office was computerised. 1st Jan '06: Vishnunagar branch office was computerised. 2nd Feb 2006: Vaibhavgauri branch office was computerised. 2nd May '10: The main branch office moved out rented office space and in to new ownership premises. 12th July '12: Organised a Co-operative Trade Fair in collaboration with the State Department. Ownership and spacious premises with all modem facilities. Highly qualified Board of Directors and trained staff. Our vision is to create an empowered society with able women and educated children. Reaching every class of society, working towards making them financially independent and self-reliant, capable of facing the challenges of today's world. 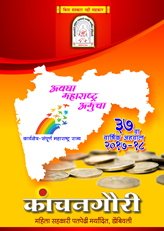 Provide timely financial help: To all those who deserve and need finance for education, business, home etc. Support education: By teaching women and children through scholarships, loans and education drives. Provide funds for social initiatives: Like afforestation, conservation of energy, rain water harvesting etc. Ensure Tribal welfare: Empowering and assimilating tribal people in to mainstream through education support as well as financial help. Expand reach through excellent operations: Widening our reach to give access to easy banking to people all over Maharashtra. At the same time to maintain our focus on clean operations, customer service and technological advancement. We also undertake numerous social initiatives allocating a percentage of our profits for such activities. We provide scholarships, donate to NGOs and offer medical support to our members.